I became familiar with “Veronica Mars” when CBS aired four episodes of the UPN series during the summer of 2005. In spite of my advancing age and my aversion to anything associated with UPN, I developed an addiction to the show, which starred Kristen Bell as a witty, smart and resourceful teen detective in southern California. Although the show’s third season disappointed me, I mourned its cancellation. I missed Veronica and her supporting cast of characters, which included a biker and a hacker. So, I was happy when I learned that, thanks to a Kickstarter campaign, a “Veronica Mars” motion picture starring Kristen Bell herself was in the works. 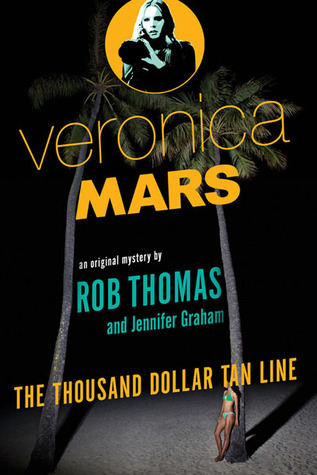 What’s more, series creator Rob Thomas and co-author Jennifer Graham were penning a two-book series of original Veronica Mars mysteries. While the movie wasn’t bad, it was just good enough to make me pine for the first two seasons of the show. Thankfully, the “The Thousand Dollar Tan Line” captured the heart and humor of Veronica who, near movie’s end, turned her back on a potentially lucrative law career and returned to her private investigating roots in her corrupt hometown. The book begins with Veronica taking the reins of Mars Investigations while her dad, Keith, recovers from injuries sustained in the book. Not that Veronica and her newly-hired IT expert, Mac, have much work to do. That changes after a coed goes missing at a spring break party and Veronica is hired to investigate her disappearance. In addition to keeping the lights on and paying Mac’s salary, Veronica’s investigation points to a dangerous drug cartel, puts her life in danger and brings a blast from her past back into her life. Although the book leaves a few loose ends dangling, the mystery wrapped up to my satisfaction. But the mysteries didn’t make me keep tuning into “Veronica Mars” and the desire to learn the fates of the not one but two missing girls didn’t make me keep turning the pages. As is the case with most fiction, the characters make the story. I was most interested in the way the book captured Veronica’s strong relationship with her devoted dad, who wants nothing more than for Veronica to leave Neptune – and the P.I. life –behind. He doesn’t understand why she won’t take the bar exam and, well, neither do I. Veronica doesn’t have to work for the swanky law firm that recruited her in the movie. In fact, that wouldn’t be a good fit for an outcast like Veronica. But that’s not her only option. She could take the bar in California and work as an attorney/detective for Mars Investigations. It makes no sense for Thomas and Graham to seemingly ignore this possibility. It’s as if they want us to believe it’s New York or bust for our feisty girl. Other than that major point, I have no quibbles with “The Thousand Dollar Tan Line.” We marshmallows get Skype sessions with the submarine-deployed Logan and best friend time with Wallace and there’s even a Weevil sighting. I can’t wait to read the second book, “Mr. Kiss and Tell.” And this time, maybe I won’t wait quite so long. In the third chapter of my cozy mystery, “Murder on Sugar Creek,” amateur sleuth Maggie Morgan joins her parents for a breakfast of biscuits, gravy, raspberry jam, country ham, and red-eye gravy. When prepared traditionally, red-eye contains two ingredients – the grease from country ham and black coffee. Some cooks refer to it as gravy while others call it a sauce. Although it’s written as red-eye gravy in the book and above, I’m stingy with gravy and sauce accolades in my personal life. So, for me, it’s simply red-eye. For years, I called the scrumptious sustenance red-eye sot. I did so until I realized the rest of my family was saying sop instead of sot. Sop, obviously, comes from the ability to sop up red-eye with one’s biscuits. Some people prefer to slather a piece of ham with red-eye, but not me. I don’t want my ham and red-eye to mix, so I soak the ham in paper towels to remove as much red-eye as possible. Yes, I realize the absurdity of performing this activity prior to or directly after I ingest scraps of biscuits doused in red-eye, but I’ve got to be me. You should not confuse this fried country ham with the cured ham that produces deli meat and Christmas dinner. 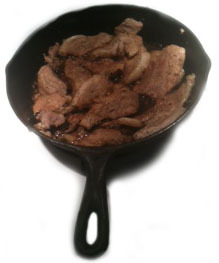 You also can make red-eye on pork chops, but I consider ham more tender and easier to pull apart. It must have something to do with all that time hogs lie around on their huge backsides. Speaking of pork, when I’m feeling really crazy, I’ll try a couple pieces of sausage, but only of the canned variety. Canning sausage involves spooning balls of seasoned, cooked pork into Mason jars. The clear jars make the meat more appealing because you can see the grease coagulate in the jar before it coagulates in your arteries. My friends, even those from eastern Kentucky, seem disgusted by the idea of eating canned meat. The way I look at it, if canned meat didn’t sell, they would have pulled Spam and Treat off the shelves years ago. As much as I love homegrown pork, I will not eat what my sister and I refer to as “hog bacon.” Yes, we know all real bacon comes from hogs, but we like to differentiate between brought-on bacon, which we devour, and homegrown bacon. We find hog bacon too coarse, salty, and fatty. It’s almost like fat back, which as its name suggests, comes from the back fat of hogs. I struggle to understand why anyone would eat something called fat back, but Mother insists it’s good and explains it’s like bacon without the meat. I eat bacon only for the meat, so I think I’ll pass on fat back, but I will take some more red-eye sop, please.